Happy Easter/Happy Passover/Happy spring holiday of your choosing! I'm just happy that the sun is finally out and the temperature is warming up - I've got the window open a tiny bit as I write this and it feels wonderful! Our family Passover Seder was on Friday. Naturally, mom asked me to bring a dessert. I was originally going to go with my old Passover-standby of Apple Matzah Kugel, but decided I really wanted to step outside the box. Joe's mom is gluten free, and I vaguely remembered making a chocolate cake for her birthday back in September. I knew the cake itself was gluten free, but I couldn't quite remember if it had any leavening agents in it (baking soda/powder, etc). though I do remember thinking that it was delicious. I managed to dig up the recipe from my stash, and, lo and behold, it's kosher for Passover! It's actually the perfect recipe if you know someone who has any type of wheat allergies. There is no flour whatsoever called for in the recipe, so you don't have to try and switch it out to something that can be eaten. Since it doesn't call for any flour, you also don't have to try and sub it out for any kind of matzah meal, which means it doesn't end up tasting faintly of matzah like most homemade Passover desserts do. 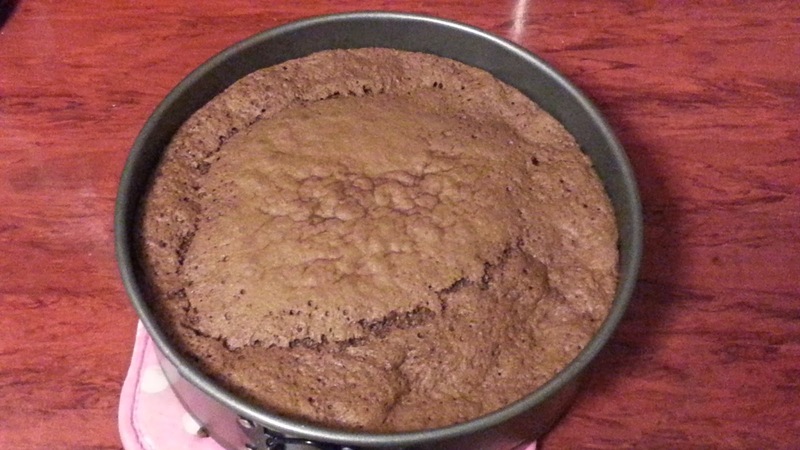 This is a mousse style cake, so it's really super light and fluffy. I served it topped with a little bit of homemade whipped cream, but a light dusting of powdered sugar would be sufficient, too. This came out slightly different than the way I originally made it, but I liked it better this way, I think. When I made it the first time, it was really dark chocolately and super rich. 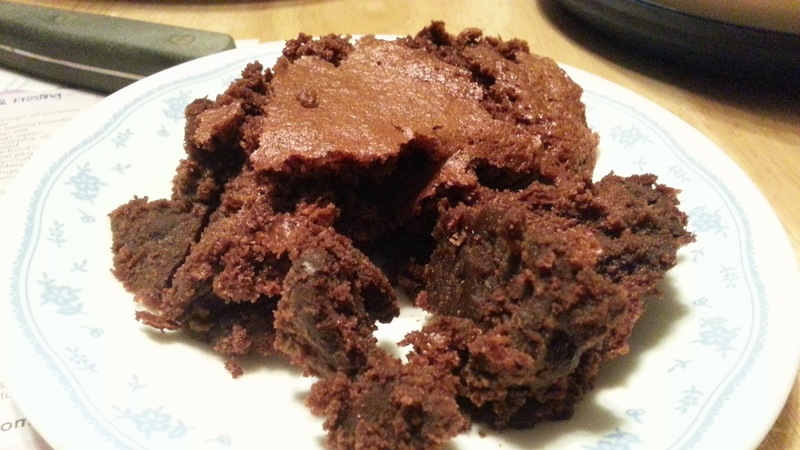 This time, I used two different kinds of chocolate, which gave it a more well-rounded flavor. When I made it for Joe's mom's birthday, the cake sunk a little, but it was the whole cake that sunk - this time around, the middle sunk more and the edges stayed where they were. That probably has more to do with the temperature in my apartment than with anything else. As you can see from the photos, I had a hard time slicing and serving the cake in the way I wanted to. I melted the butter and chocolate in the microwave instead of using the double boiler method, so that may have changed the consistency just enough to make my cake a little less stable. I had left this on the counter overnight, but next time, I'll probably try putting it in the fridge or freezer to see if that makes serving it any easier. If your family is anything like mine, they won't care what it actually looks like - they'll just be thrilled to be eating a dessert that tastes like "regular food"! Preheat oven to 250°F. Grease an 8" springform pan and set aside. Using the double boiler method, combine butter and chocolate and stir until melted. In a large bowl, combine the egg yolk and sugar. Mix until the eggs are a light yellow color. Slowly add in the chocolate sauce and stir to blend thoroughly. In a separate bowl, beat the egg whites until stiff. Add half of the egg whites to the chocolate mixture and beat until combined. Fold in the remaining egg whites. Pour batter into the pan and bake for one hour and fifteen minutes (75 minutes). Remove cake from oven and set on a wire rack to cool.